Shiny trousers and stripy blazers abound in the WNO’s opening to the Figaro Forever season. The Barber of Seville at Bristol Hippodrome. Photo: Richard Hubert Smith. The Welsh National Opera have a tradition of arranging their short seasons thematically. Previous offerings have included Spellbound, which fused together fairy tales and magic to create a series of evenings shaped by birdmen and gingerbread men. Similarly, Madness saw the company branch out into musical theatre with Sweeney Todd. A highlight of these seasons – and one that is suited to its concise duration – has always been the use of humour, along with set and costume design. Examples include Papageno in the Magic Flute and Joanna’s Virgin Suicides-esque bedroom in Sweeney Todd. Even when not performing a musical, the WNO have always brought something more suited to that genre to opera. For opera-purists, that would be enough to warrant never attending their shows, but at a time when getting more people inside stalls and listing to arias is desirable – as shown by the Tobacco Factory’s annual staging of Opera Project – the WNO’s less highbrow approach to the repertoire should be seen as a positive aspect. Their spring season 2016, entitled Figaro Forever is comprised of three operas: Rossini’s The Barber of Seville, Mozart’s The Marriage of Figaro and the world Première of Elena Langer’s new opera Figaro Gets a Divorce, and it seemed like both a fun evolution of their themed seasons, and a chance to be at their jolly, well-dressed best. It was, therefore, slightly a surprise to see that their opening night performance of the Rossini was slightly underwhelming. In true form to the season, the star was indeed the hair-chopping marriage-arranger himself. Nicholas Lester in trousers borrowed from Lady Gaga’s Super Bowl American anthem performance brings a certain charming swagger to the piece, and it is only a shame that we do not get to see more of him leading the action. With Nico Darmanin as Count Almaviva, the production has at its centre a rather dapper little duo that dispel all residual nightmares of the Chuckle Brothers in reclaiming the short-tall Italian duo trope in some style. 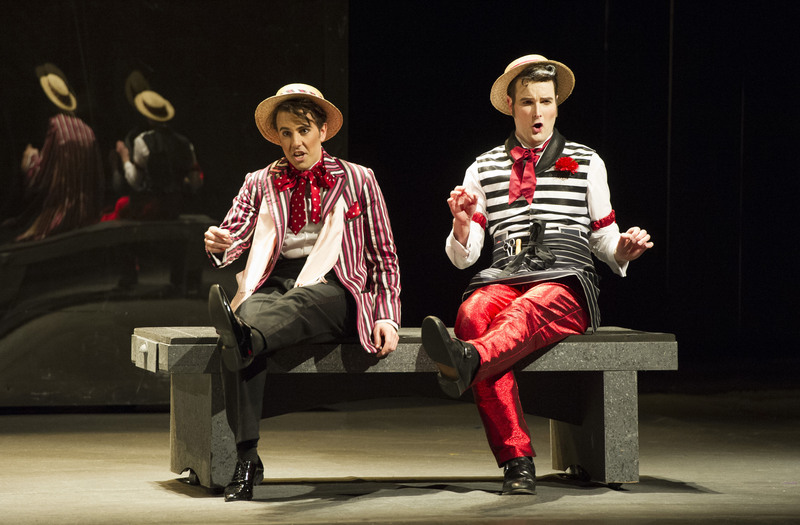 Along with Figaro’s shiny red pants, we also have many a barber’s shop boater and a rainbow of natty striped blazers. Unfortunately, these two main characters and their costumes (designed by Sue Blane) get lost amongst a sea of other characters against the backdrop of grey walls. Set design by Ralph Koltai consists mainly of two large rotating walls, which the characters flip round throughout the show. For all that is lost through making the cast continuously interact with the set, not much is gained especially given the unchanging scarcity of the props. Heaving the scenery around begins to just seem like a lot of bother and there are a few occasions where an unwanted thwack into one piece or another causes a fraught moment of shaking, in which great sheets of Perspex threaten to come racketing down. Perhaps it is a case of almost too good a fit. Whereas the WNO have previously brought a dose of humour to where it wasn’t found before, aiming for flat-out comedy ends with the on-stage equivalent of a frosted cupcake topped with a cherry, topped with a Haribo, topped with a glittery fondant unicorn. The decision to perform it in English adds to the ‘accessibility’ scoreboard, but deducts a lot of the lyricism from the most famous numbers, particularly La calunnia. With a plot this simple, the audience could probably be relied to make do with the Italian and surtitles. Midway through it feels like we really hit a bum note when we reach the point of fart jokes. Despite all this, it still managed to be a production that was on the whole entertaining and wouldn’t put me off seeing other WNO productions. It just needed a little trim and tidy – maybe a neatly applied wax strip here and some liberal tweezing there. The Barber of Seville was staged as part of the WNO’s Figaro Forever season. Click here for more details. Cast includes Nicholas Lester, Claire Booth, Andrew Shore, Richard Wiegold and Nico Darmanin.